This bach is right on the water, have caught fish from the deck. You can put the whitebait net out, or just simply relax and look at the water. View from lounge is panoramic, from ocean around and up the river. 2 min walk up beach for surf casting, kayak up river or if you are that inclined out to sea. West coast fishing at its best. 40 min from Waitomo caves, 10 min from Marokopa falls, Natural Bridge and bush walks. Smoking outside only. All butts to be removed, do not throw butts out on to the lawn. There is a fully self contained unit attached to this property, which is not included in the bach price. The unit is available for rent at an additional charge of $60.00 per night. You do need to supply your own bed linen and towels in both cases. The unit has a queen size bed and is suitable for a couple. Minimum stay 2 nights for this property. I cannot imagine a more beautiful place in the world. Thank you Peter for sharing it and for being so easy to deal with, especially when we forgot to take our own linen. Our sincere apologies for that. 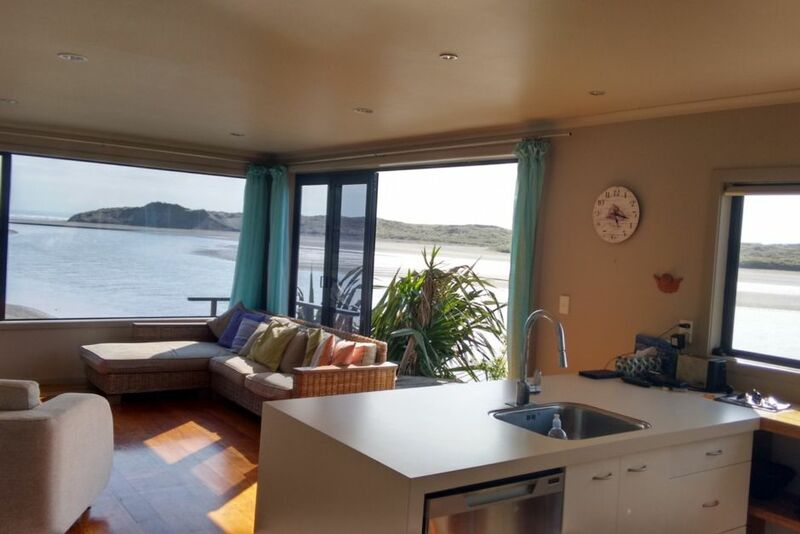 Brilliant views over the river and ocean with fantastic sunsets! Bach is very well equipped, including with lots of cleaning equipment, but unfortunately previous occupants left toenail clippings, dirty floors and grimy bathroom. Fantastic view, especially the sunset. Very homely. Would come back again. We love this place, this would be about our 5th visit to the property. It won't be our last. Wonderful location, friendly neighbours, lots of fish, entertaining birdlife, pleasant bush walks and spectacular coastline nearby, what more could you want? Only downside, the nearest shop is in Kawhia BUT there is a (very nice) cafe at Te Anga!